Happy November, everybody! Can you believe 2011 is almost over? I’m kind of freaking out over here. The good news is Halloween is over, fall is in full-swing, I can post soup and stew recipes and feel good about myself, and Thanksgiving (aka my favorite holiday) is on its way. My friend told me about this stew and promised it was lick-the-bowl worthy. We already have a Beef Stew recipe that we love, and I still maintain its awesomeness, but that is a really great “toss it in the oven and forget about it” recipe, whereas this is a chilly, rainy, fall afternoon meal that you make with lots of love and fresh ingredients. It’s something you could serve to guests, and you can always freeze the leftovers and heat them up on a busy weeknight. You’ll start with some chopped onion, carrot, and garlic. A little way down the road, you’ll also need some nice mushrooms (like baby portabella or cremini) and some cubed beef. Chop the onions, some of the carrots, and the garlic and set it aside. Heat about a tablespoon of extra-virgin olive oil in a stock pot or a Dutch oven over medium heat. 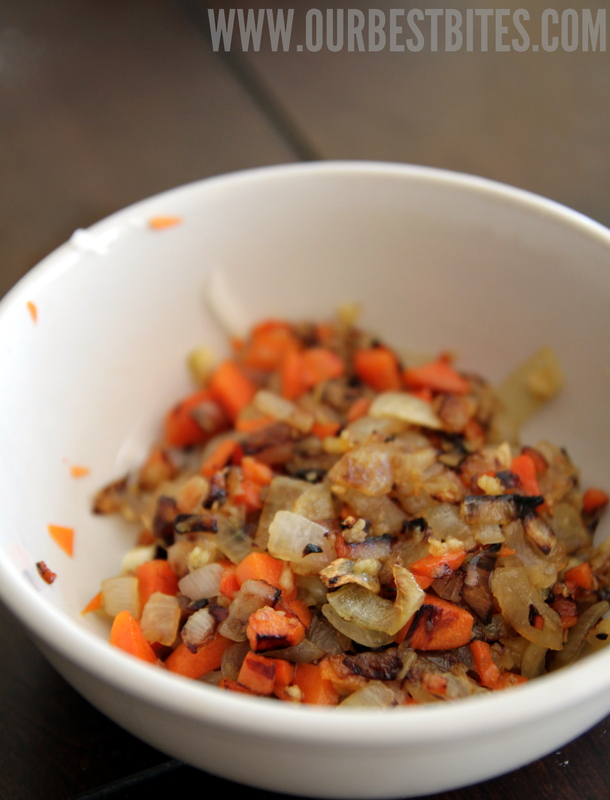 When it’s hot, add the onions and carrots and saute for about 5 minutes or until the onions are tender and translucent. Add the garlic and saute it for about 1 more minute, stirring constantly. Remove it from the pan and set it aside. Add another tablespoon of olive oil to the pot. In a shallow dish, whisk together 1/4 cup flour, 1/2 teaspoon kosher salt, and 1/2 teaspoon coarsely ground black pepper. 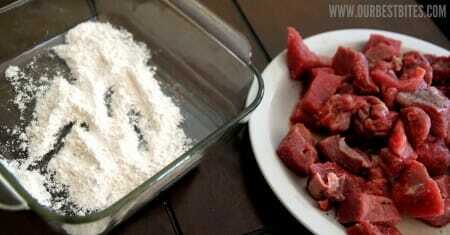 and then transfer the beef to the pot. Cook the beef on medium-high heat for 5-6 minutes, browning it on all sides. Remove from the pan and set aside. 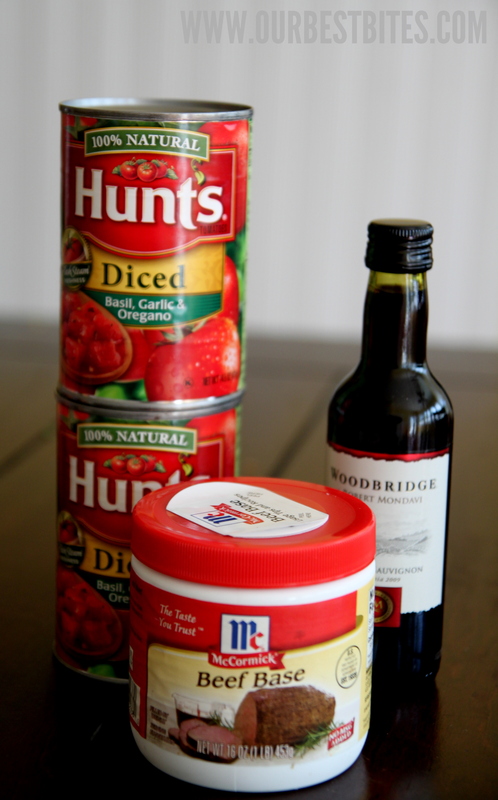 Now you’ll need the liquid ingredients–Italian tomatoes, beef broth (or stock or water and beef base), and red wine or grape juice plus 1 tablespoon of red wine vinegar. Pour the wine (or juice/vinegar mixture) into the pan and allow it to deglaze the pan (loosen up the cooked bits on the bottom of the pan). Scrape it regularly for about 5 minutes or until the liquid is reduced by about 2/3. 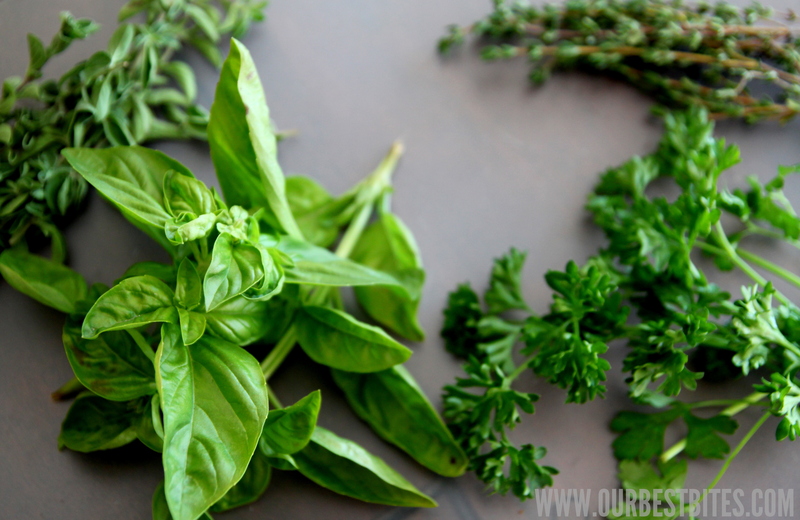 Aren’t all those fresh herbs gorgeous? We’ve got fresh basil, parsley, thyme, and oregano. Strip the thyme and oregano leaves from their stems and then chop up about 2 teaspoons of each. Add those to the stew mixture along with 1 bay leaf. We’ll use the basil and parsley a little bit later. Chop the onions, first batch of carrots, and the garlic and set it aside. Heat about a tablespoon of extra-virgin olive oil in a stock pot or a Dutch oven over medium heat. When it’s hot, add the onions and carrots and saute for about 5 minutes or until the onions are tender and translucent. Add the garlic and saute it for about 1 more minute, stirring constantly. Remove it from the pan and set it aside. Add another tablespoon of olive oil to the pot. In a shallow dish, whisk together 1/4 cup flour, 1/2 teaspoon kosher salt, and 1/2 teaspoon coarsely ground black pepper. Toss the beef in the flour and then transfer the beef to the pot. Cook the beef on medium-high heat for 5-6 minutes, browning it on all sides. Remove from the pan and set aside. 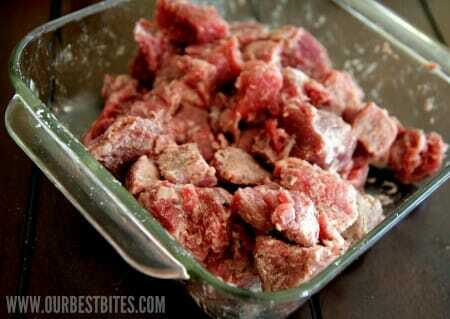 Return the meat and onion mixture to the pan. Add the undrained canned tomatoes, broth, and water. Strip the thyme and oregano leaves from their stems and then chop up about 2 teaspoons of each. Add those to the stew mixture along with 1 bay leaf. Add your mushrooms and some more chopped carrot to the stew. Bring it to a boil and then cover the stew and reduce the heat to a steady simmer for about 1 1/2-2 hours or until the beef is tender. Discard the bay leaf and then add some chopped parsley and basil and season with salt to taste. Serve it with crusty bread. Makes about 8 servings. Freezer Instructions: Prepare through deglazing the pan. Place all of the ingredients except for the water, fresh basil, and fresh parsley into a freezer bag or freezer safe container and freeze. Freeze the herbs separately in a small freezer safe bag. When ready to serve, place the contents of the large freezer bag and 1/2 cup of water into a slow cooker and cook on high for 6- 8 hours or on low for 8-10 hours. 1 hour before serving, add fresh herbs. I agree! How are we less than 2 months away from 2012?? I swear this year has gone faster than the last! Where’s the beef? In the ingredient list, I mean. Am I just overlooking it because it is waaaaay beyond my bedtime? This sounds like a beef stew that I could really get into. 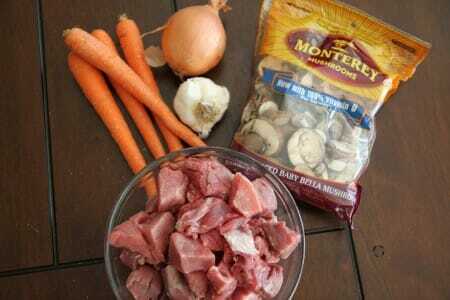 I love stews and soups this time year and I think that adding the italian flavors probably gives a good change. Looks awesome too! Making this next week! Wow!!! All the fresh herbs… sounds delicious, but I think it would break my budget. Would you please recommend amounts of dried herbs I could use to make this stew? I’m making caramelized onions tonight, only because I bought 5 pounds of onions last week and don’t know what else to do with them! Do you think they’ll taste good in the Italian stew? I was leaning toward pork, but the stew looks yummy! Go for it!! It would be amazing! Why do you suggest extra virgin olive oil in a dish like this? Wouldn’t plain olive oil do just as well and cost less? I know using extra virgin in salad dressings, etc. is important for flavor, but in stew, that is cooked, does it make a difference? You can use any kind of oil you want, but I think the extra-virgin adds another dimension to the stew. This looks very similar to my beef stew and I serve it over mashed potatoes which is to DIE for (I also dislike the mealy, mushy potatoes in most stews). Mine also calls for balsamic vinegar instead of the red wine vinegar and I like the deep richness it adds. I am sure this is delic! Do you prefer the wine or the juice/vinegar mix when you cook this recipe? Yum! I made this Friday night. I added diced yellow potatoes instead of carrots – delicious and hardy! It was a big hit with my girlfriends with crusty bread and a caprese salad. Thanks! Seriously, where does the time go?! This stew looks delicious – perfect for a chilly fall day! this looks amazing and its whats for dinner one night this week. i love getting these emails!! i take full credit with my hubby and kids for all your great ideas, by the way, and am loving all the praise. LOL! This looks amazing! And it’s definitely stew weather! Made this last night in my crockpot…didn’t use carrots or mushrooms (hubby won’t eat them)…used a deer roast…it was amazing!!!!! Served over rice. No leftovers!!! Love stew and even better would love the food calendar. being married to a vegetarian, i rarely get to eat beef stew, which is one of my favorite dishes from childhood. i love this italian spin on it! i just made this and it was amazing. fresh herbs probably arent neccesary (i only used fresh basil) so if your on a budget this is still do-able. the broth looks beautiful. This was wonderful! Satisfied a pregnancy craving…so thank you!!! My daughter clued me in to your wonderful website and recipes. We have hunters in our family and a wealth of lean venison which lends itself well to several of your recipes like this on and the Shephed’s Pie – Thank You! Would I be able to use grape juice with balsamic vinegar instead of the red wine vinegar? I have plenty of balsamic on hand, but would have to go buy some red wine vinegar. I made this tonight, and while it did take a little while to make, it was worth it! The family agreed this was a home run! Thanks, Kate! P.s. I served with mashed potatoes, but I wouldn’t next time. Crusty bread would suffice as suggested. Simmering away right now! I am going to make Pioneer Woman’s Crash Hot Potatoes to go along with it.